Just a short hop down on Southwest Airlines from Manchester Airport and we were in Baltimore's BWI airport. Abbie picked us up and we were back at their house by around noon - we took an early flight. Pat and Marissa decided to go shopping, so we dropped them off and Alan and Colin and I went about "more manly things" as my brother put it. 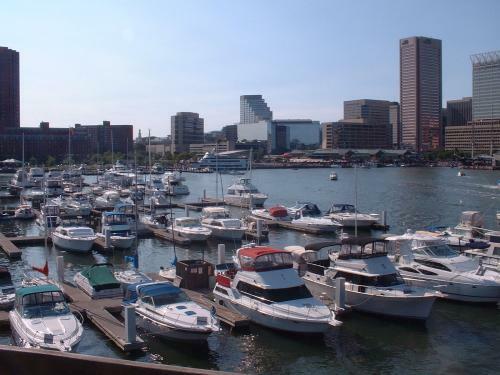 Then Sunday and Monday, we took the Light Rail commuter train down to Baltimore's Inner Harbor and had a great time. We had been to the Science Museum and Aquairum last trip just a couple of years ago so we spent the time just exploring and walking around. 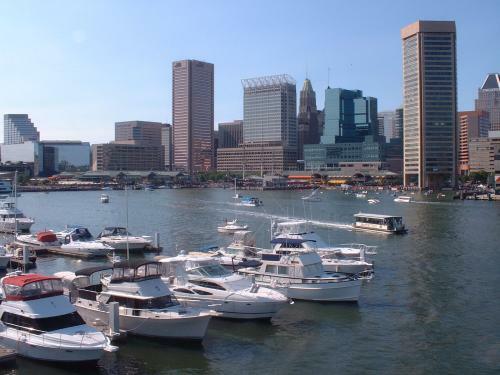 The weather was very nice - this time of year Baltimore can be brutal! Then, Monday night after having dinner at a great Irish pub, Colin somehow caught a moth in his ear. We did everything to get it out. I even used Abbie's turkey baster to see if I could flush it out, but to no avail. So, off to a emergency care facility. Colin got the prize for the most unusual case of the day as they locked the doors behind us just after we got in! 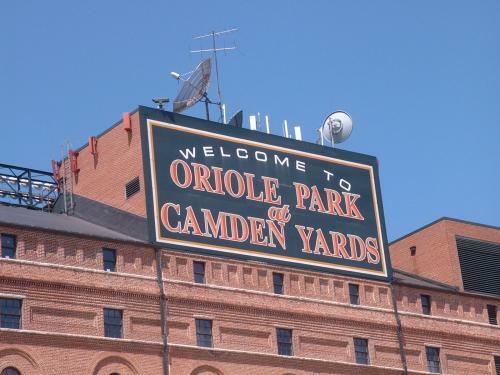 The Light Rail drops you off right at Baltimore's famous Camden Yards. Pat just had to get this picture for her dad, Tom. This picture was taken from the Rusty Scupper resturant at the end of the boardwalk (past the science museum). The next picture pans right across the Inner Harbor. The Rusty Scupper was a marvelous spot to end Sunday's sight seeing with a drink. Colin downed 2 frozen drinks and enjoyed watching the boats go by. Are these guys having fun or what! 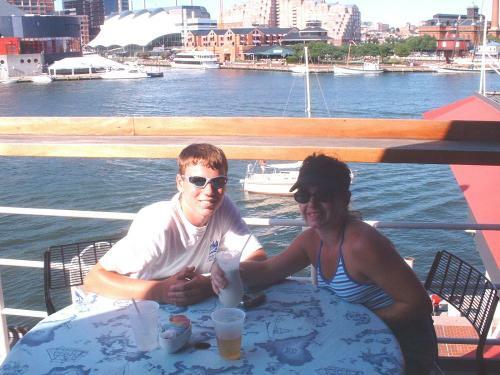 Colin and Pat soaking up the Baltimore Summer sun at the Rusty Scupper. 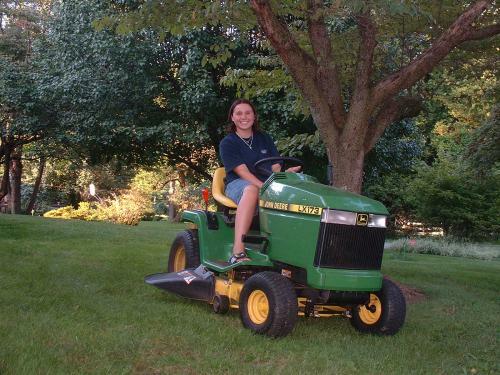 I had emailed Alan that he better have that tractor in operational order and lots of gas because all Marissa could talk about for weeks before heading out was driving it around again. She really likes that tractor. She even cut their grass - though Colin was equally thrilled with it and got to most of the grass before she did. What a great resturant Alan and Abbie thought of for our last night's dinner! 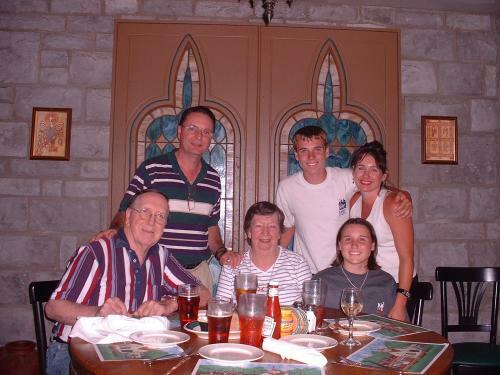 A great Irish pub not far from the house. More Killian's Red, please... I even got Alan to have a couple, though he cursed me later. That's ok, bro. Try to bear up under the pressure!